Relationship Boredom: Should We Break Up? At Symmetry Counseling, we are now accepting reader-submitted questions for our blog! This week, a reader writes in to ask about relationship boredom. If you are feeling bored in your relationship, does that mean you should break up? In the video above, Dr. Anne Malec answers this question. 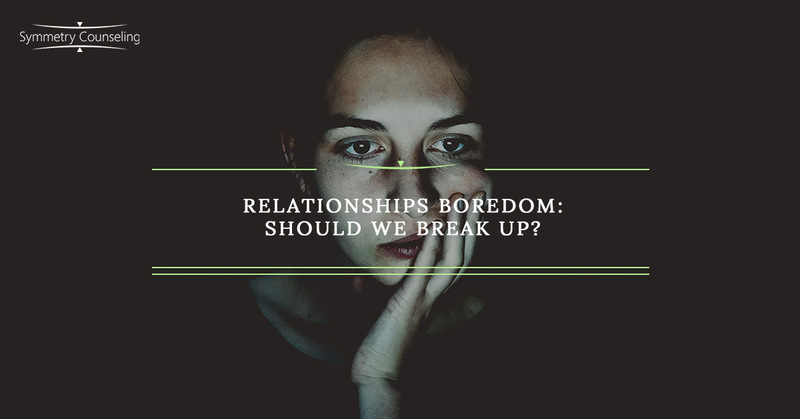 It is typical for us to hear this concern in our practice, so if you are experiencing boredom in your relationship, you aren’t alone. After being with someone for a while, it’s typical to feel that loss of a “spark.” There is no longer that feeling of novelty and newness, so you might start to feel listless in a relationship. You may wonder if that means that you aren’t with the right person, and you should break up. While it could be that breaking up is your best option, before you do that, consider that it may be that what you are really bored with is yourself. Perhaps you are in a rut. If you aren’t feeling challenged at work, you don’t like your job, you aren’t engaging in activities that interest you, or haven’t expanded your social circle in recent history, your disinterest may be in your life as a whole rather than your relationship specifically. Before you end a relationship, take some time for introspection. Is it your partner that bores you, or do you have a general lack of interest within yourself? Consider this before leaping into a breakup. Have a question you would like answered by one of our therapists? Submit your question here, and contact Symmetry Counseling for therapy in Chicago.